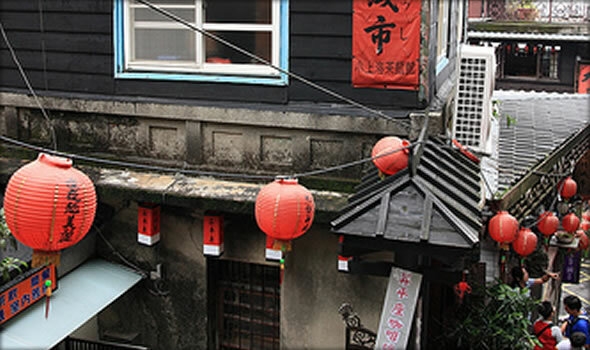 Feel the oriental nostalgia with Jiu Fen’s quaint ancient charm that traces its paths back in history. Sitting at the top of a mountain up northern Taiwan, Jiu Fen used to be an isolated town up in the highlands, isolated from the rest of the world. It was until the 1800s where gold was discovered in the area, where the town then began bustling in prosperity as a hot gold mining field. As the gold died down with depleted resources in the 1980s, so did the commotion. The population dwindled but Jiu Fen already stands with an eclectic of culture over years of diversed ethnic influences. The fervor for Jiu Fen was revived once again after several renowned international films began to take shoot in this town, reviving reminiscence to the beauty of this village’s exquisite aura. Today, Jiu Fen reflects its glory from the golden days. From the Japanese Colonisation period where people from all over the region flocked in to try their hands at fortune, the town is now a concoction of Japanese, Chinese and British architecture and cultural tinges. Also known as “Little Shanghai”, with much resemblance to the olden Shanghai era, the town is stepped with alleys and rows of shop houses that offer a wild variety of food, goodies, clothing, handicrafts, calligraphy, shoes, Chinese brushes and scrolls, jewelries, toys and souvenir of all sorts. There are also restaurants, street stalls and dessert shops that provide a plethora of gourmet indulgences. 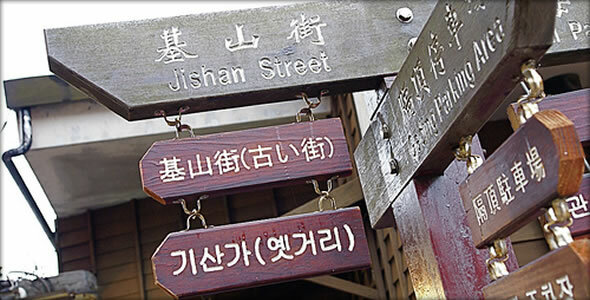 Visit the heart of town, Jiu Fen Old Street and enjoy thoroughly the Jiu Fen lifestyle and culture. The street runs through most of the village with a multitude of food such as yam dishes, stinky toufu (a must-try!) and other local specialties such as peitou meatballs and mixed vegetables topped with peanut powder and ice cream! Red lanterns are predominately hung along the shop houses and it’s amazing just how so many things are cramped up in such a small area. Nonetheless, it brought about the strong flavor of bustling Old Street and the local authenticities it has to offer. The scenery at Jiu Fen is also one that completes an overall sensory experience. There are several loggings and teahouses that oversee the village, bringing the beauty of Jiu Fen right before your eyes. Spend a leisure afternoon at a teahouse up in the mountains where you can savor and enjoy the fragrance of local tea complete with stunning views of mountains, rivers and seas. You can also witness traditional tea ceremonies and learn of the art of tea appreciation, the Chinese way. 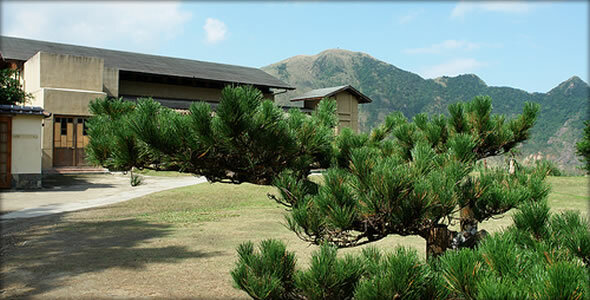 Take a walk down memory lane at Jinguashi, home to the Gold Ecological Park. Over here, the Park preserves some of the area’s Japanese era architectures and houses a museum that tells the story of the town’s gold mining days. You can take a hike into the mine, which is now preserved for tourists to have a real-life experience of the good old mining era. Situated at the hill top, you might want to take your time to explore the splendid views of Jiu Fen, as well as the various flora and fauna found along the park. Nature enthusiasts can take a hike up Mount Jilong where air is especially fresh in the morning, providing a revitalizing and rejuvenating start to the day ahead. Or you can take a drive downhill along Keelung bay to enjoy the breeze and marvel at the beauty of mountain-sides merging into the sea. Less than 2 hours from the metropolis of Taipei, Jiu Fen provides the ideal weekend escapade not only popular amongst the locals, but also a place for tourists to seek an antiquated yet heartwarming experience. You can take a 45-minute train from Taipei Main Station to Rueifang Station and then catch a 15-minute bus ride from the main road directly in front of the station that heads towards Jiu Fen.